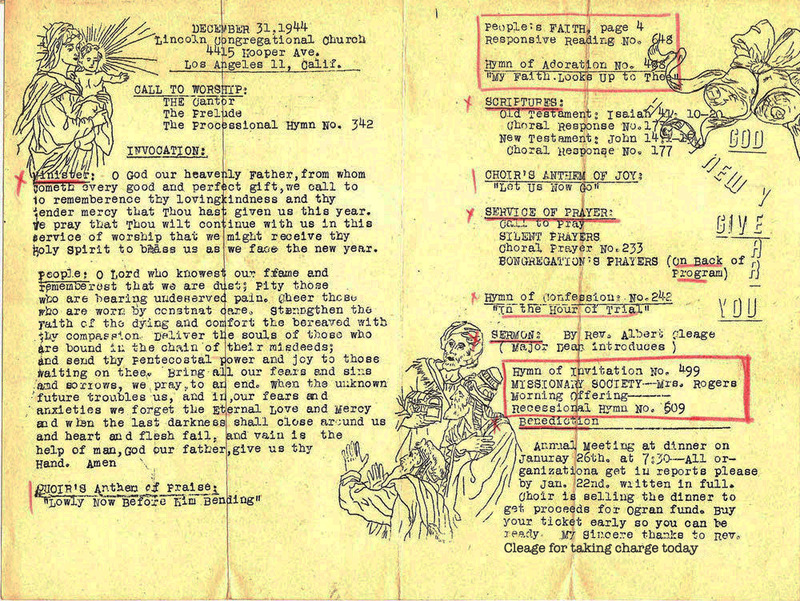 A letter written home to Detroit by my parents on New Year’s Eve, 1944. My father was studying Cinema with the plan to use it in his ministry in the future. The inside of the bulletin from the New Year service. Well it’s New Year’s Eve…10:25 p.m. here…so we’re waitin’ for the New Year…and its 1:25 a.m. there… so you-all are already into 1945. I suppose you-all had a little Coffee-Ice-Cream and Tuna-fish salad n’ that celebration.. and since Hugh was in for Christmas I suppose Henry was in… leavin’ po’ little Hugh out at Plum Nelly by his lonesome. We just finished supper and my “worster-half” is stretched out on the couch reading Soroyan’s “Human Comedy”. I can’t remember whether you-all read it or not. If not get it (Barbara) cause it’s good… in its own way. Henry and Hugh ought to like it. I preached this morning at the Congregational Church. The minister, Reverend Galloway went up to some “Snow Mountain” with his young-people for some sort of New Year’s Conference. He asked me sort of late… but Doris made me do it…so I did. We had sort of a time getting ready at the last minute n’ that. Doris had to put my one still presentable suit back together with a needle and thread (they all fell to pieces at the same time) … and press my robe which I haven’t used since leaving Lexington… and I had to “prepare my message” Saturday night. We got to bed about three A.M…and got up at eight-thirty because it takes about an hour to get down off of Sugar-Hill and across town to the East Side…on the Streetcar. Major Dean assisted me in the Pulpit as a Deacon and introduced me to the Congregation (again). See enclosed Bulletin. I arrived at 11:03 (late as usual)…Me and the choir rushed in at the same time. (Negroes is Negroes the world over…like Daddy’s Fried Chicken) The service went very well…and the attendance was very good in spite of the absence of the young-people…bigger crowd than the other times we’ve been present. I brought them a powerful New Year’s Message (which I will have Doris describe in detail in as much as I’m modest!) After the service the people were very nice…invited us to the annual church supper and that. Mrs. Dean was present and threatened to have us over soon. She said that she’s been ill for the past three months…and has planned to write you-all for lo these many months but… first one thing and then another n’ that. Her brother Captain York has been sick in the hospital for some several months…but seems to be improving she said. A young woman and her little son of about six (or so) joined the church under the power of the message and that. The officers didn’t quite know what to do when they said they wanted to join but we finally fellowshipped them N’ that. Everyody was very nice but all neglected to mention the customery “HONORARIUM”… which, of course, I didn’t mention…but thought about nevertheless! Dear Folks, Wish you all could have been at Church this morning. Toddy preached one of the best sermons he’s ever preached – and that I’ve ever heard. A very simple theme – Text: “the Kingdom of God comes not with observation; the Kingdom of god is within you” – with his own pecular interpretation and illustration. It was good. Thank you for the lovely Christmas presents and a very Happy New Year. P.S. After the sermon “Montgomery” rose as a body and testified for the reverend. My aunt Gwen’s cousin from Alabama said, “I have been in Los Angeles six weeks and I belong to the Episcopalian church, but this is the first time since I’ve been here that I really feel like I’ve been to church.” Amen! What detailed planning for the service your father undertook. You can learn a lot from these notes. Interesting letter. It’s nice that they liked his sermon, but they should have given him an honorarium if that was customary. Happy New Year! Reading these letters takes you back in time and place. I find them all fascinating. Thanks for sharing. It’s all so fascinating seeing this unfold.